One of my favorite places in the world is the Abby Aldrich Rockefeller Garden in Seal Harbor, Maine. It is open ten or so days a year to a limited number of visitors and I usually manage to be among them. 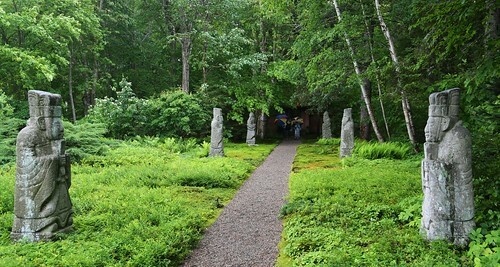 The Abby Aldrich Rockefeller Garden in Seal Harbor, Maine. The Rockefellers bought their summer home, the Eyrie, in 1910 and though it eventually had 106 rooms, the rocky soil of the Granite State does not easily accommodate gardens. Given that they had a big terrace with a view of mountains, boulders, fir trees, streams, mosses, ferns, and the distant ocean, the Rockefellers could hardly have missed a manicured garden. Still, in 1926, Mr. and Mrs. John D. Rockefeller Jr. decided to build a secluded garden at some distance from their overgrown, overly busy Tudor-style mansion. Five years earlier the Rockefellers had journeyed to China to attend the dedication of a new building for the Rockefeller-funded medical school, Peking Union Medical College. Their three-month long Asia trip enhanced their passion for the Far East. 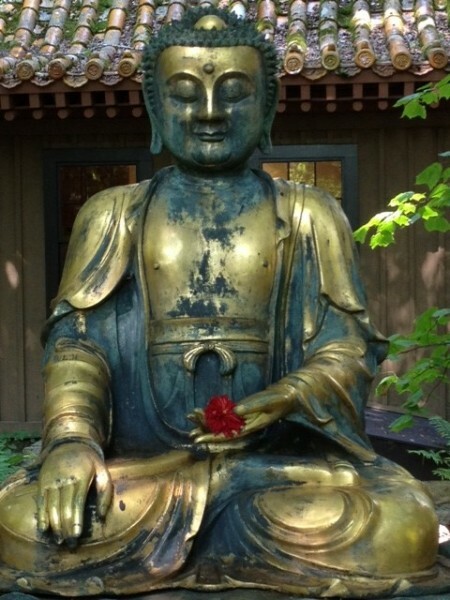 Their new garden, Abby decided, would combine the spiritual nature of the East with the more worldly gardens of the West. To help them, the Rockefellers engaged Beatrix Farrand, a founding member of the American Society of Landscape Architects, who fortuitously also summered on Mount Desert Island. Felling trees, removing roots and rocks, leveling the terrain, and bringing in tons of topsoil was the first order of business. The main elements of the garden were in place by 1928. 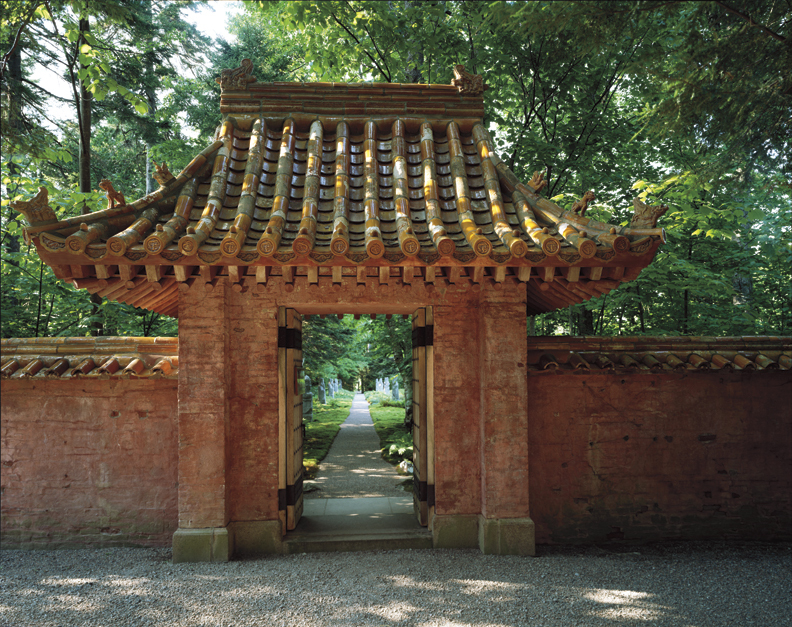 They consisted of a Spirit Path lined by twelve large Korean stone guardians, a rectangular lawn, framed by a border of garden flowers (the sunken garden), a small pool enclosed by an oval lawn and shrubbery, a shade garden, and several small enclaves ideal for rest and contemplation. Suddenly it became known that a large number of coping tiles from a newly dismantled section of the Forbidden City’s enclosure might be for sale in China. 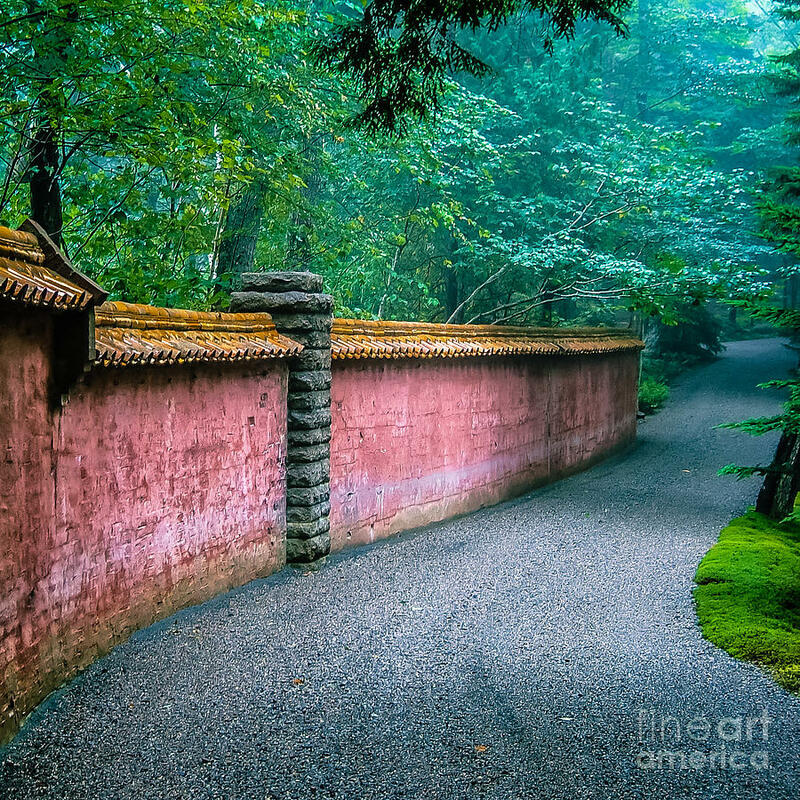 Farrand revised her plans and enclosed the nascent garden in a pink stucco wall crowned by six thousand glazed yellow coping tiles. Today it is hard to believe that the wall was an afterthought! The garden is now almost ninety years old. Thanks to the concentrated care of nine gardeners it may even more beautiful today than in its youth. 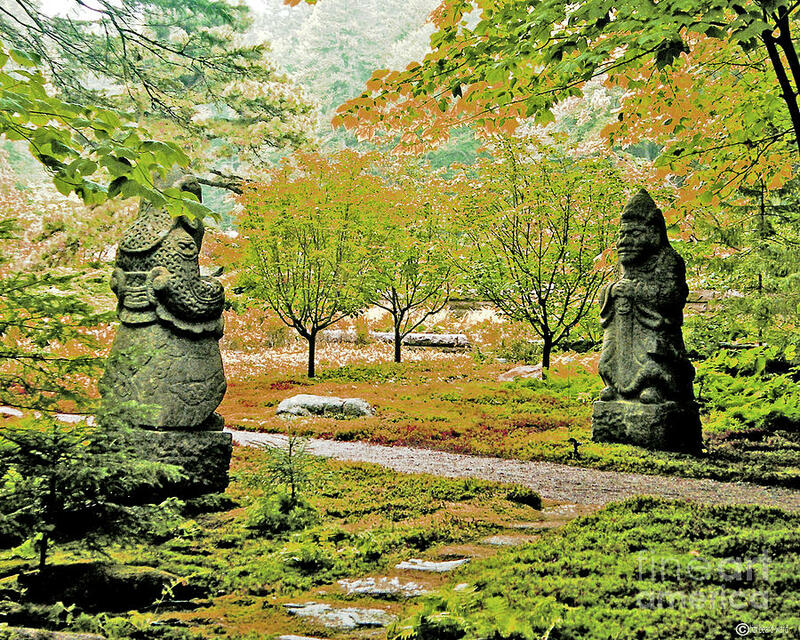 Thick moss carpets mysterious enclaves along the Spirit Path; bunchberries and blueberries encircle the feet of the Korean officials; two gilded Buddhas, shaded by ancient pines, sit silently on their thrones; and other exquisite sculptures are strategically placed throughout. The festive summer flowers add joy to inner peace. How glorious our world can be! I commune with my favorite haunts: The barely visible stone toad from 18th-19th century Japan, the monk (17th century Edo period) that fondles a tiger cub, and the thick lips of moss that almost hide a foot-wide stream. Silently I pay tribute to the artists who created the sculptures that enhance the magic garden, to the gardeners who see to it that everything is perfect during the short two months that this Eden comes to life, to Beatrice Farrand, who designed it and wrote to her patron on October 26, 1928 that “the wall lines were tentatively staked out yesterday with much fussing and refusing and changes of curves here and there.” And of course to the Rockefellers, who loved it into being and footed the bill. During the two hours that I am allowed to spend here, it is hard to think of the bombs that harass and kill my fellow humans in their not-so-distant lands: Israel and Gaza, Iraq, the Ukraine…the children trying to storm the southern border of the US, the families that mourn those who died aboard the Malaysian airliner! This entry was posted in Uncategorized and tagged abby aldrich rockefeller, Abby Aldrich Rockefeller Garden, Beatrix Farrand, eyrie, gardening, gardens, landscapes, landscaping, maine, mdi, mount desert island, rockefeller family, rockefeller foundation, rockefellers, Seal Harbor. Bookmark the permalink. I know what you mean about having a hard time holding a peaceful personal reality and the terrible violence in the world in mind at the same time. Maine is not the granite state, it is the pine tree state. Yes, you are absolutely right–a slip of the mind.